Are the Texans ever going to win a game? If they plan on doing so, tonight is the night. The talent discrepancy between these two rosters is real. 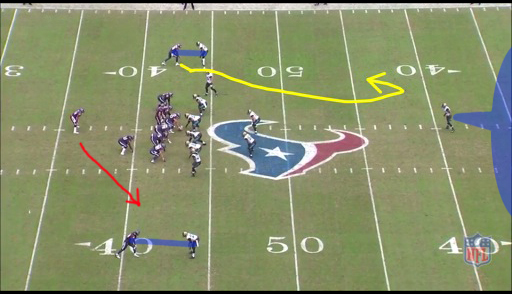 Theoretically, the Texans should have several advantages. However, some of their best players like J.J. Watt had great outings last time these two teams met and it did not matter. This will be yet another indicator of whether the Texans have packed it in or not. Case Keenum also must continue to show he has value to this franchise beyond this year. His worst outing of 2013 was the game against these Jaguars in Week Twelve. The race for the number one overall draft pick. This was billed as the “Teddy Bridgewater Bowl” a few weeks ago, but Jacksonville does not seem to want any part of that. After going the first few months of the season without any wins, Jacksonville has suddenly won three out of their last four, and is playing with great pride. Gus Bradley’s bunch certainly is not concerned with draft positioning; in the moment winning is more important for players. However, Jacksonville still desperately needs a franchise quarterback no mater what. Will they be in a better position to get one after this game is over? As dreadful as this game would seem, sometimes these games have a way of altering the entire landscape of the NFL for reveal years. Do not click that remote just yet. 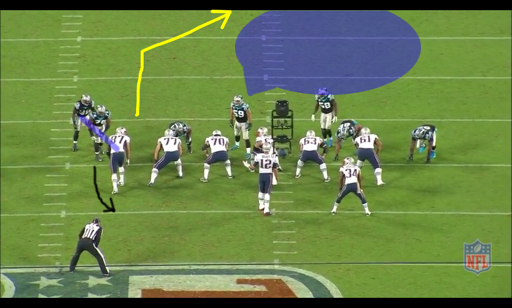 The defensive tackle is able to move Keenum off his spot, redirecting him to his right. He dumps the ball off to Ben Tate, and the play goes for a modest four yards. Sometimes pressure makes a coverage unit look better, but in this instance Alan Ball’s excellent coverage on Johnson allowed the defensive line the time they needed to break this play up. While this may not seem too significant, the play above was exactly the type Keenum and Johnson were using to torch teams in the weeks prior to that game. When the duo let the Jaguars into their house, there were no such opportunities. All thanks to Alan Ball’s outstanding play. Ball has just been getting better and better, and it will be interesting to see if he can replicate his Week Twelve performance against Johnson tonight. Expect to see Ball lined up in tight man coverage against the super star receiver yet again. If Andre Johnson cannot put up better numbers than the two catches for 36 yards he registered previously against Ball, the Texans will be hard pressed to snap their losing streak. Can the Panthers dethrone the Saints for the NFC South crown? Will the Seahawks suffer a letdown in San Francisco after throttling the Saints last Monday Night? Will the Eagles keep pace with the Cowboys in the NFC East? When their teams face off, which rookie quarterback will look better, E.J. Manuel or Mike Glennon? Can the Chiefs defense rebound against a slumping Washington offense? Since he is a great player, Brady tries to fit the ball in to his star tight end anyways. 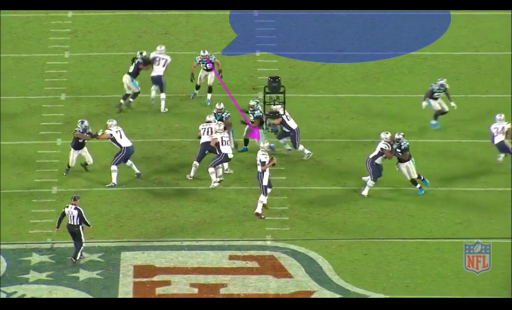 However, he cannot try to hit Gronk directly or that is an easy interception for Keuchly, and with Lester effectively covering him as well, there is no easy place to throw to. 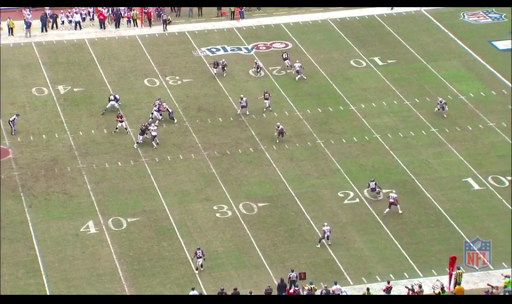 Brady does not manage to get the ball in Gronkowski’s hands and the result of the play is an incompletion. While Luke Keuchly is a very athletic defender, when going against an elite player like Jimmy Graham on Sunday night, expect the Panthers to give him some help. A similar strategy helped them a few times against another great player a few weeks ago. The Saints may make things a bit trickier for the Panthers because they split Graham out a bit more often than the Patriots do with their superstar tight end. 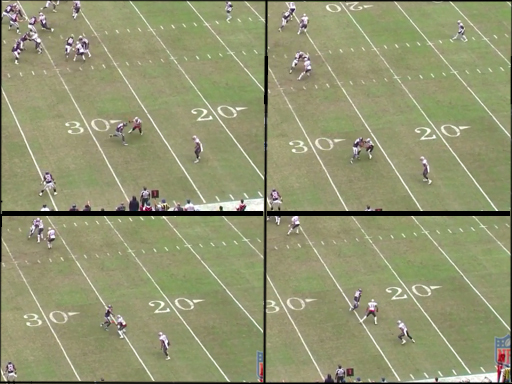 With McCourty following Keenum’s eyes and coming over top of Johnson he cannot go deep. 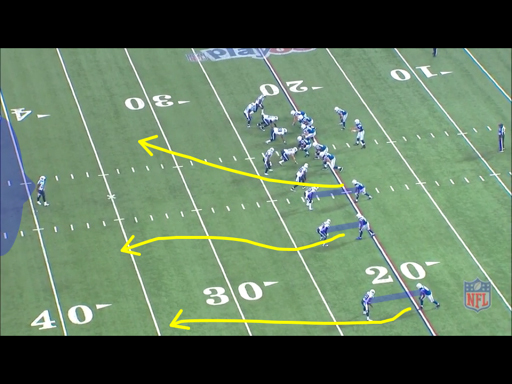 However, Johnson is a master of cutting on his routes, and snaps back to face the quarterback with urgency. 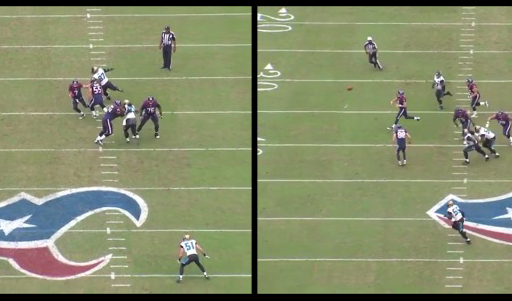 Johnson gets himself plenty open and receives a pass from Keenum. 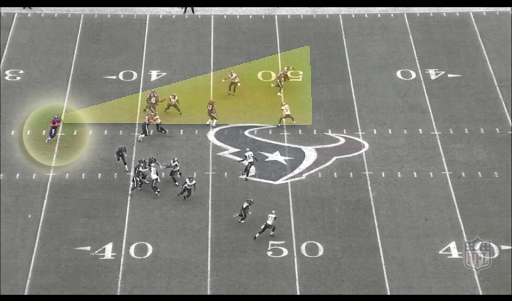 Now, Josh Gordon is not Andre Johnson yet, but he needs to play with this kind of technical savvy if he plans to win this matchup on Sunday. The Patriots are simply not going to allow him to get deep on them like the Steelers and Jaguars did over the last two weeks. He will need to be physical and make precise cuts to get open; much like Andre Johnson did to the tune of eight catches for 120 plus yards last week. The receivers are all locked up and Andrew Luck has no one to throw to on this play. 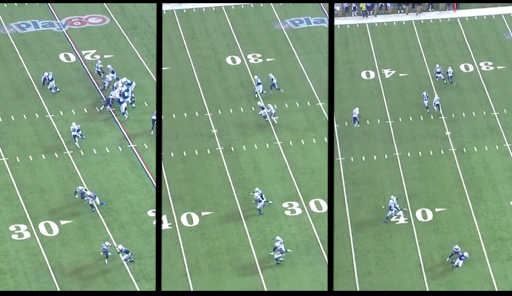 On a third and long, Luck is trying to move the sticks and forces the ball to T.Y. Hilton (top receiver). 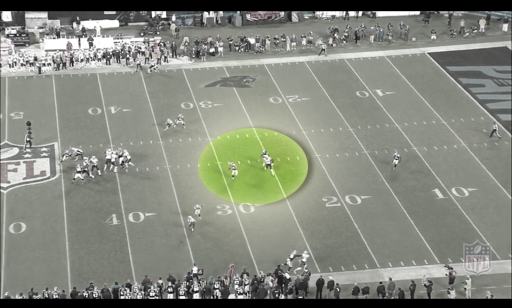 With no space for the ball to go to, the safety is able to come over to the ball and snare an interception. The tight man coverage from the Titans corners left the Colts without much passing production and forced poor decisions from their quarterback. Of course, the Broncos receivers are eons better than the ones the Colts field, and Peyton Manning is not likely to make such poor decisions. However, if the Titans can play this well in man coverage, it may mean the Broncos have to feature a hobbled Julius Thomas. 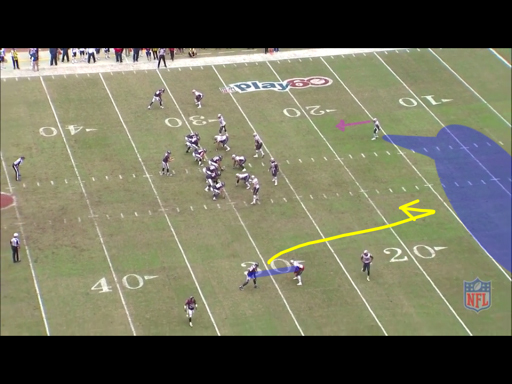 Look for Peyton Manning to get the ball out on screens and get Wes Welker reestablished in the short passing game. Receivers are just not getting open deep often against these cornerbacks. For a look at why Jared Cook could have another big day, check out this week’s "Eye in the Sky"